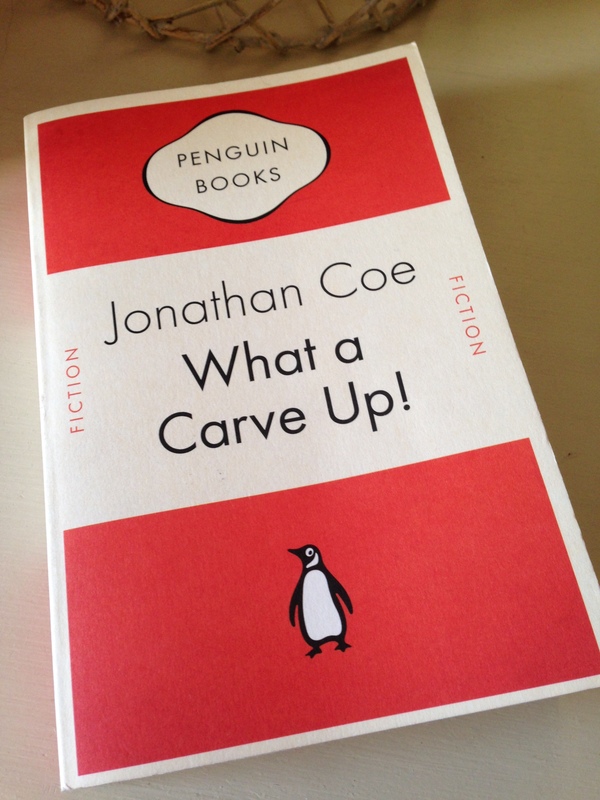 Back in September, Guy (at His Futile Preoccupations) reviewed Jonathan Coe’s Expo 58, and in the comments thread a few of us expressed interest in joining a readalong of this author’s 1994 novel What a Carve Up! / The Winshaw Legacy. Marshalled by Seamus (at Vapour Trails), we settled on a December read with reviews to go up today. What a Carve Up! is a very skilful combination of two main narrative threads, the first of which centres on the infamous Winshaw family. The prologue to the book opens with a mystery reaching back to the days of WWII when Godfrey Winshaw, a British pilot, was shot down by the Germans while on a top-secret mission over Berlin. His distraught and devoted sister, Tabitha, is convinced that her elder brother, Lawrence, is behind Godfrey’s death. In the frenzy that follows, Lawrence consigns Tabitha to a nearby asylum where she is to remain indefinitely, only to be granted a fleeting release for a family reunion some nineteen years later. The occasion is the fiftieth birthday of Mortimer, another brother to Tabitha and Lawrence, and the only other member of the Winshaw clan who appears to possess a decent set of moral values. (More on the rest of the Winshaws later.) Tragedy strikes the family once again as an intruder breaks into Winshaw Towers only to be killed in a violent altercation with Lawrence. There’s a suggestion that the intruder may have been out to get Lawrence, but the circumstances and motive surrounding the attack are far from clear. These mysteries prove central to the Winshaw family history which brings me to the second strand in the story: that of a young writer named Michael Owen. The timeline shifts to 1990, and we discover that during the 1980s Michael was commissioned to document the official biography of the Winshaws (Tabitha, still residing in an institute for the actively insane, instigated the project despite the opposition of her family). With a sizeable chunk of the family’s history already documented, the manuscript has been festering for the past few years due to Michael’s withdrawal from society – the young writer has been suffering from depression due to difficulties with the book and a painful disagreement with his own mother. But in a chance meeting, Michael befriends and falls for his neighbour, Fiona, and with her encouragement he resumes work on the text in the summer of 1990. Henry’s diaries expose the key tenets of Thatcher’s political strategy: the privatisation of Britain’s core utilities; the introduction of business thinking and targets into the NHS; the attachment of a financial value to quality of life; the cutting back of the welfare state…many more. And we see how these policies touch the lives of real people as the financial constraints imposed on the NHS end in tragedy for one character in Coe’s story. In another chapters we meet Hilary, the right-wing television-producer-turned-tabloid-journalist. Hilary writes a weekly column, entitled ‘PLAIN COMMON SENSE,’ providing a platform for her rants on ‘issues ranging from the welfare state and the international situation to the length of hemline sported by members of the royal family on recent social outings.’ Hilary’s chapter is peppered with newspaper reports and magazine articles, including a toe-curling Hello! feature designed to present the perfect public face. It’s all a façade of course, a mask to hide her train-wreck of a marriage and immoral lifestyle. Then there’s Roddy, the art dealer, and Mark who deals in a more dangerous commodity by supporting Saddam Hussein in the development and stockpiling of illegal weapons. Perhaps the most horrific chapter of all is reserved for Dorothy: a merciless pioneer in the development of intensive farming methods, a woman with no regard for animal welfare. Coe doesn’t pull any punches in this section as he exposes the ‘solutions’ to the ‘problems’ Dorothy encounters in her efforts to maximise the yields and profits from rearing chickens and pigs. The details are truly shocking. These characters are so vile and unlikeable that the reader might start to feel somewhat worn down by their nastiness. But Coe counterbalances this by adopting a satirical tone and by alternating the Winshaw chapters with Michael’s own story. As a narrator and as a character, Michael is very easy to engage with as he tries to get his life back on track by forming a connection with Fiona. And we will him on in his attempts to unravel the mysteries surrounding the Winshaw family history. Michael is damaged, preoccupied with events and stories from his own past. In particular, he continues to reflect on memories of an ill-fated birthday visit to Weston-super-Mare and a trip to the cinema to see the 1961 comedy-horror film, What a Carve Up! Michael recalls being transfixed by Shirley Eaton, the film’s leading lady, but to his dismay his mother hauled him out of the cinema at a key moment: a scene where Kenneth Connor shies away from spending the night with Shirley despite his obvious attraction to her. As a result, Michael has developed a somewhat unhealthy fixation with the film, Shirley Eaton and the story behind the scene in question. I thoroughly enjoyed What a Carve Up! It’s a wonderful blend of mystery, satire and socio-political commentary on the period, very cleverly constructed and plotted. Coe’s range is impressive as he switches between different forms and styles to present the story. For the most part, the political messages are conveyed in an engaging way, and it’s easy to forgive the occasional soap-box moment when the author’s heart is firmly in the right place. The closing section feels like an Agatha Christie-style murder mystery as the key players in the story return to Winshaw Towers for the reading of a will. The ending is satisfying yet poignant, the mysteries and connections are unravelled, but to say any more would only spoil the surprises in store should you decide to read this novel for yourself. This novel is ambitious and rich in detail, so much so that I feel I’ve barely scratched the surface here. I’m looking forward to reading the reviews by Seamus, Guy and Kim – I’ll add links once they’re available. It’s also my book group’s choice for January, so plenty of discussion to come. Click here to read Guy’s review and Seamus’s review. What a Carve Up! is published in the UK by Penguin Books. Source: personal copy. Book 2/20 in my #TBR20. This entry was posted in Book Reviews, Coe Jonathan and tagged #TBR20, Book Review, Fiction, Jonathan Coe, Penguin Books, UK on December 28, 2014 by JacquiWine.